Thornham is a medium-sized parish on the north Norfolk coast. The village straddles the main road along the coast. Thornham comes from the Old English meaning ‘homestead or village where the thorn trees grow’. The earliest archaeological evidence from the parish are Palaeolithic flints including flakes, scrapers and blades (NHER 1300, 1304) that have been found on the beach. A prehistoric quern (NHER 14286), Neolithic axeheads (NHER 1301, 1302, 1304 to 1307) and a Neolithic macehead (NHER 14931) have also been found. During the Bronze Age a large peat deposit was formed on what is now the beach between Hunstanton and Brancaster. The remains of a prehistoric forest (NHER 1354) are visible within the deposit on the beach at Thornham. 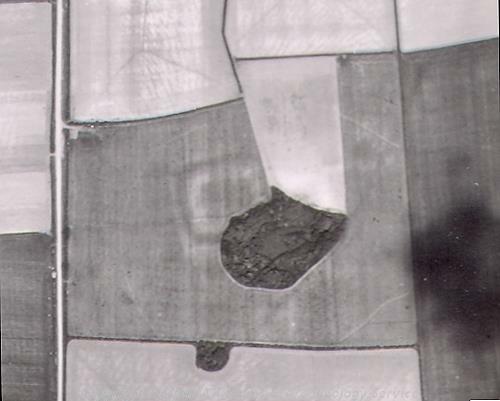 The cropmarks of possible Bronze Age ring ditches (NHER 11896, 12852) have been recorded from aerial photographs and three Bronze Age axeheads and metal working debris (NHER 41091) were found during metal detecting in 2004 and 2005. The finds are probably part of a dispersed Bronze Age hoard. Thornham Fort (NHER 1308) is an Iron Age or Roman fort that is clearly visible as an enclosure on aerial photographs taken in the 1940s and 1950s. Excavations in the 1950s and 1960s revealed that the enclosure was constructed in the 1st century AD, and it appears to post-date the Roman invasion of AD 43 although it was probably the product of native planning rather than Roman construction. Several shallow graves containing human skeletons were found within the enclosure indicating that the site was re-used as a cemetery in the Early to Middle Saxon period. The cropmarks of possible Iron Age round houses (NHER 1310) are visible on aerial photographs and metal detecting has recovered Iron Age linch pins (NHER 1309, 41922) and an Iron Age brooch (NHER 41158). Roman finds from the parish include coins (NHER 1312, 14373, 23471, 28953, 41158, 41696, 41922, 45403), fragments of pottery (NHER 1322, 15343), tile (NHER 1313), a cosmetic pestle (NHER 35642), brooches (NHER 35642, 40974, 44069) and a Roman urn containing a human cremation that was ploughed up in 1948 (NHER 1311). There is some archaeological evidence of the Saxon period. Metal detectorists have found a Middle Saxon pin (NHER 35642) and a strap fitting (NHER 44069), a Late Saxon brooch (NHER 1317), a bridle link (NHER 14373), a stirrup terminal (NHER 41158), a strap end (NHER 41158) and fragments of pottery (NHER 14334, 15342). In the Domesday Book Thornham was held by the Bishop of Thetford, and is recorded with a mill and a flock of five hundred sheep! 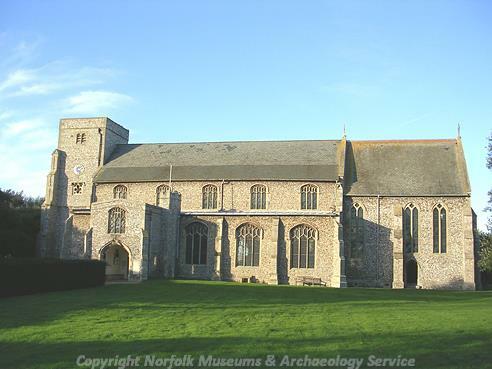 The only medieval building to survive in the parish is All Saints’ Church (NHER 1347), which dates mainly from the 13th and 15th centuries and was restored in the 19th century. The church has many Early English features including the south door and a Perpendicular nave, clerestory and aisles, and contains a number of interesting 15th century carved bench ends, part of a late 15th century painted rood screen and medieval brasses. Beacon Hill is the site of a medieval beacon that is recorded in medieval documents dating from the 13th century (NHER 1315). 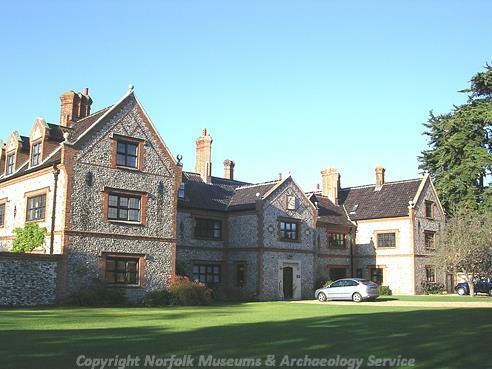 Thornham Cottage and Ilex Cottage (NHER 13268) are an early 16th century knapped and galleted flint house with brick and carstone dressings. The house has a central porch with an arched entrance and a hoodmoulded window with a datestone of 1624. One of the rooms on the interior has wood panelling dating to about 1700. The Manor House (NHER 13269) is a late 17th century house that was restored in 1910. The King’s Head Hotel (NHER 46862) and the Chequers (NHER 46922) both date to the 17th century. Oak House (NHER 38143) is an 18th century house that incorporates 17th century woodwork. The Red House (NHER 40702) is an 18th century house with bow windows, dormer windows and Diocletian windows. Thornham Hall (NHER 11308) was built in about 1780 for George Hogg, a wealthy merchant from King's Lynn. The house is built in the Neo-Classical domestic style, and has a central 3-storey block of 5 bays flanked by 2-storey wings of a single bay. The interior of the house contains original plaster friezes depicting classical scenes and marble fireplaces. A landscape park (NHER 30526) was laid out around the Hall, and many of the trees date from the original layout. The kitchen garden dates from 1778 and there is a 19th century brick icehouse (NHER 1342). The Coal Barn (NHER 1319) is an 18th or 19th century brick and flint building on the quayside that was probably used for storing coal and other goods. The barn was used as a location for the BBC adaptation of Great Expectations filmed in 1998. Thornham Primary School (NHER 23767) was built in the mid 19th century in the Gothic style. The building has large Gothic windows and a porch tower with a mansard roof. The Old Vicarage (NHER 39612) is an imposing carstone house built in 1905 in the style of Edwin Lutyens. In the post medieval period there were efforts to reclaim land from the coastline for agricultural use. The earthworks of several post medieval sea defence banks (NHER 26763, 26762, 26902, 26899, 27181) have been recorded from aerial photographs. The faint earthworks of post medieval ridge and furrow (NHER 26766, 26904, 26908) are visible from the air. The Thornham Composite (NHER 1341) is the remains of a 19th century windmill that was re-erected on this site in 1880 from its original location in Ringstead. The mill was last used in 1896. In the early 20th century there was a brickworks (NHER 29154) in what is now the garden of Marsh House. No buildings are shown on early 19th century maps, although the house that now stands on the site is thought to date to the 18th century. The most recent archaeology in the parish dates from World War Two. 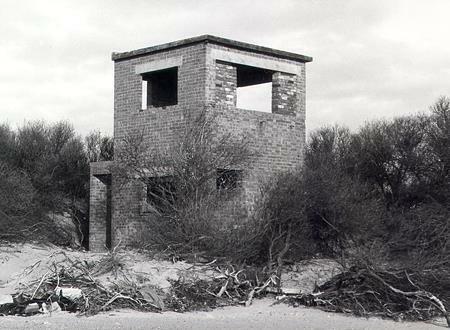 The coastline was heavily defended against the possibility of a German invasion, and military buildings (NHER 18077, 18078), a pillbox (NHER 26711), a spigot mortar emplacement (NHER 23519), beach scaffolding (NHER 26713, 26705, 26764, 41431 to 41435), a bombing range marker (NHER 26709, 26710), a minefield (NHER 26900) and a tank trap (NHER 37596) have been recorded. Sarah Spooner (NLA), 7 September 2006.